Above: Chris Graham. 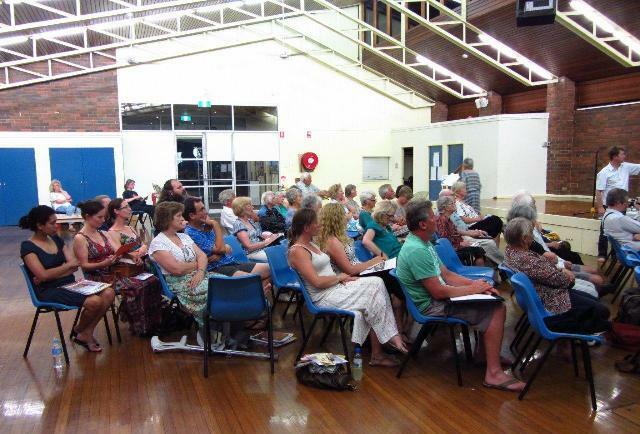 Below: Large Attendance at Monday Night's Meeting. The Northern Territory National Emergency Response (also referred to as "the intervention") was a package of changes to welfare provision, law enforcement, land tenure and other measures, introduced by the Australian federal government under John Howard in 2007 to address claims of rampant child sexual abuse and neglect in Northern Territory Aboriginal communities. Operation Outreach, the intervention's main logistical operation conducted by a force of 600 soldiers and detachments from the ADF(including NORFORCE) concluded on 21 October 2008. The package was the Federal government's response to the Territory government'spublication of Little Children are Sacred, but implemented only two out of ninety-seven of the report's recommendations. The response has been criticised, but also received bipartisan parliamentary support. The current Prime Minister Julia Gillard has and continues to support the response, though her predecessor Kevin Rudd did make some adjustments to its implementation. The Emergency Response has since been lapsed, and is being replaced. The Northern Territory Intervention was originally drafted by the Howard Government, with Indigenous Affairs Minister Mal Brough being the chief architect. The Rudd Government took office in 2007 and pledged to continue the policy, though Indigenous Affairs MinisterJenny Macklin ended the suspension of the Racial Discrination Act in 2010. The Labor Party replaced Kevin Rudd with Julia Gillard in 2010 and the Gillard Government also pledged to continue the Intervention. By February 2011, the original architect of the policy, former minister Mal Brough was arguing that the Intervention Policy had become stagnant and wasn't going to work unless it was revitalised. In April 2011, Opposition Leader Tony Abbott proposed consultation withIndigenous people over a bipartisan Federal Government intervention in Northern Territory towns like Alice Springs, Katherine and Tennant Creek which would cover such areas as police numbers and school attendance in an effort to address what he described as a "failed state" situation developing in areas of the Northern Territory. Though the plan achieved broad bi-partisan support in the Parliament, it has also been criticised by the Northern Territory Labor government, the Human Rights and Equal Opportunity Commission and by several Aboriginal leaders and community spokespeople. The plan was also given strong or qualified support by other community groups and Aboriginal leaders. The measures of the response which have attracted most criticism comprise the exemption from the Racial Discrimination Act 1975, the compulsory acquisition of an unspecified number of prescribed communities (Measure 5) and the partial abolition of the permit system (Measure 10). These have been interpreted as undermining important principles and parameters established as part of the legal recognition of indigenous land rights in Australia. More generally, a lack of consultation with Aboriginal community leaders is often cited by critics of the response, alongside the fact that the action addresses very few of the specific recommendations contained in the Little Children are Sacred Report, while introducing many measures not suggested in the Report. The Intervention has now cost over $2 billion and there has been little housing put up, attendance rates at school are still falling, the reasons given for the intervention were lies and the army have been housed in expensive demountable housing while aboriginal children hang themselves in despair. 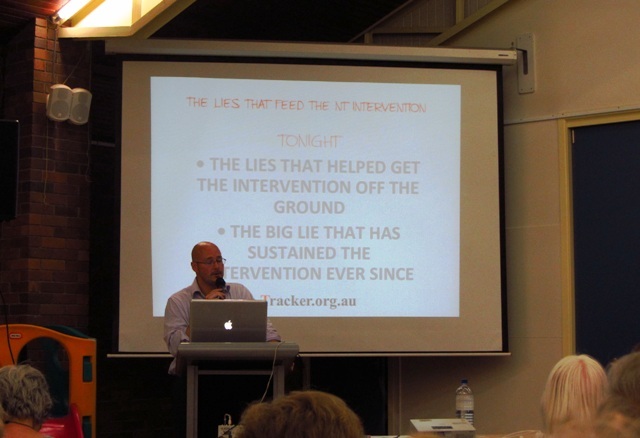 Last year, Chris Graham toured Australia with an explosive presentation ‘The Lies that Built the NT Intervention’, which revealed that the ABC Lateline program falsified much of its reporting that led to the 2007 Howard government policy. Using government reports and data from the 2007 and 2010 federal elections, Chris Graham exposes the lies that not only feed the NT intervention, but allow the largest human rights violation of our generation to continue. Chris said the Northern Territory intervention has harmed Aboriginal people; it’s caused starvation; it’s seen a dramatic rise in reports of self-harm incidents; it’s driven children away from school; it’s wasted hundreds of millions of taxpayer dollars. In short, it’s been a disaster for the nation’s most disadvantaged citizens; the people who could least afford it. Walter Shaw, President of Tangentyere Council in Alice Springs, has described the Intervention as "one of the most significant disasters in the history of interaction between Aboriginal Australia and Government since colonisation. It introduced alcohol controls, compulsory quarantining of welfare payments and land acquisitions to allow for proper tenancy management to occur. Howard announced what is effectively martial law in those Aboriginal townships across the Northern Territory where his Government began sending in police and troops to "deal with what we can only describe as a national emergency in relation to the abuse of indigenous children". Howard's national emergency was a political one. He had an election to win. The genuine national emergency he hid behind is the one his Government has ignored effortlessly for 11 years. Chris said that the Northern Territory was not a land grab as some had speculated. Nevertheless the Federal government took over leases of 30 and 40 years held previously by aboriginal communities under land rights legislation. The LAND has already been grabbed, by colonial invasion and conquest. The Northern Territory experiences higher rates of suicide in younger people than those experienced in many other parts of Australia. This is generally attributable to rates in Indigenous populations as Indigenous males aged between 25 and 44 years have the highest risk of suicide followed by the 10-24 year age group. In contrast, among non-Indigenous males, the risk of suicide appears to increase with age (Measey, Li SQ, Parker, 2005). fluctuations can be observed due to the relatively small number of suicide deaths, combined data for the period 2002-2006 suggests a NT suicide rate (22.4 per 100,000) that is more than double the national average (10.4 per 100,000) (ABS, 2008). Copyright Neil Evers, 2011. All Rights Reserved.